Located in Arlington, Virginia, this sculpture depicts the raising of the American flag over Iwo Jima and is dedicated to all Marines who have given their life in defense of the United States. Defeating Germany was only part of America's mission. 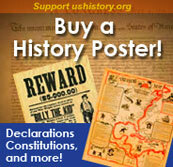 Pearl Harbor was only the beginning of Japanese assaults on American holdings in the Pacific. Two days after attacking Pearl Harbor, they seized Guam, and two weeks after that they captured Wake Island. Before 1941 came to a close, the Philippines came under attack. 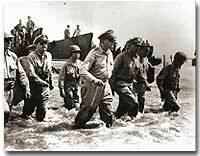 Led by General Douglas MacArthur, the Americans were confident they could hold the islands. A fierce Japanese strike proved otherwise. After retreating to strongholds at Bataan and Corregidor, the United States had no choice but to surrender the Philippines. Before being summoned away by President Roosevelt, General MacArthur promised: "I shall return." Before he returned however, the Japanese inflicted the Bataan Death March, a brutal 85-mile forced on American and Filipino POWs. 16,000 souls perished along the way. The map inset depicts the movements of both the Japanese and Allied forces during the Battle of Midway in June 1942. In June 1942, Japan hoped to capture Midway Island, an American held base about 1000 miles from Hawaii. Midway could have been used as a staging point for future attacks on Pearl Harbor. The United States was still benefiting from being able to decipher Japanese radio messages. American naval commanders led by Chester Nimitz therefore knew the assault was coming. In 1941, Gen. Douglas MacArthur was forced to surrender the Philippines, but made his famous promise of "I shall return." Three years later, he made good on his promise to liberate the islands. Island hopping was the strategy used by the United States command. Rather than taking every Japanese fortification, the United States selectively chose a path that would move U.S. naval forces closer and closer to the Japanese mainland. In October 1944, MacArthur returned to the Philippines accompanied by a hundred ships and soon the islands were liberated. The capture of Iwo Jima and Okinawa cleared the way for an all-out assault on Japan. Despite heavy losses, the Japanese refused to surrender. They intensified the attacks on American ships with suicide mission kamikaze flights. In April 1945, President Roosevelt died of a brain hemorrhage, and Harry Truman was unexpectedly left to decide the outcome of the war in the Pacific. 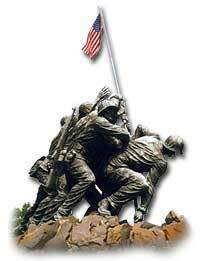 No foreign army had ever walked on Japanese soil, until the Battle of Iwo Jima in February 1945. The land assault proved to be one of the bloodiest in World War II with 6,000 American casualties and nearly all — some 22,000 — of the Japanese killed. Become informed with this superb collection of essays, and feast your eyes on images of Iwo Jima statues, movies ... even postage stamps. This webpage is dedicated to explaining the campaign waged against the Japanese from the air during World War II. Color images are the norm here, with descriptions of each, and the page is broken into sections for easy viewing: "The Men," "The Aircraft," and "The Carriers." A neat feature of the site is the way you can view the images. Just place your cursor on the link without clicking, and a small version of the picture appears in the upper left corner of the site. Well done! Images abound in this website about the U.S. Navy's role in the war against Japan. Sections on military transport, intelligence, bases, biographies, battles, statistics, and more. The Battle of the Coral Sea was the first clash between aircraft carriers in naval history and marked the end of Japan's supremacy in the South Pacific when the Allied forces thwarted the Japanese plan to conquer Australia. Approximately 5,338,000 soldiers and 10,370,000 civilians were killed in the Pacific Theater alone at the end of World War II.